“Shifting Definitions of Art: Municipal Support, Graffiti Production, Institutional Constraints” – Caitlin Frances Bruce, PhD. Over the last six weeks I have continued my field work with the Muraleon team in León, am also been building my knowledge base about youth culture and the emergence and function of youth as a social category for political and intellectual inquiry, and through observation and conversations learning more about the social and political dynamics of León. September 16 is Independence Day, and it is announced by a grito, a public shout by elected officials to renew enthusiasm and commitment to la Republica. It is also celebrated by partying, chile en nogada, and a parade. The parade in León took place on Calle Madero, the historic walkway for the city, and a symbolic space for Leonese identity, beginning with the Arco de Calzada and ending with the Plaza Principal. The participants included police, firefighters, and military (including the K-9 division proudly outfitted with vests and stretchy leg warmers) who assumed action poses (some holding ropes that were suspended from truck beds, legs posted against the back of the truck, appearing as if they were about to base jump into conflicted territory), and whose presence was announced by all sirens on every vehicle ramped up to maximum volume. Other participants included religious associations, riding on floats or walking with mantas (cloth signs) with images of their patron saint. Yet other participants included caballeros, men in full cowboy regalia on horses with braided manes and checkered patterns stamped or shaped onto their hindquarter, caballeras in detailed dresses with extensive piping, and children on little ponies. Civic groups designed floats with scenes from the conquest, and the revolution. The next day, September 17, across Mexico feminist groups held marches protesting ongoing femicide. With shouts like “Ni una más! Nos la queremos vivos! Las calles están nuestras!” and heart breaking testimony from the father of a young woman in León who was recently murdered, where he took aim at both institutional complacency and impunity, and then a consciousness raising exercise where in the very same Plaza Principal we stood, a smaller inward circle facing a larger external circle, and discussed recent moments where we had felt afraid walking in public space; what we do to keep ourselves safe; and what we do to keep our compañerassafe, with hugs at the end, a different performance of the nation took place, one that highlighted its intensely gendered inequality. It was not a massive group, maybe 40 or 50 people, but, my colleague Lupe informed me, it was an excellent turnout for León where there is “not such a culture of street protest and activism,” a truth that was evident in the surprised and curious, and sometimes critical, looks of passers-by. I bring up these two moments to remind us that public space is a place of contention and ongoing production and reproduction of the myth of sovereignty, as well as acts of gendered violence and exclusion (my other colleague at Ibero, Dr. David Martinez led a study about piropas, cat calling, as verbal acts of violence). Legal graffiti art is not exempt from the work of producing, reproducing, and challenging the state. Whereas in 2010 the legal graffiti program in León was deeply involved in celebrating Mexican Independence through a series of bicentennial murals, some still extant on the underpass where Lopez Mateos passes the IMSS hospital in the city’s western side, the current program does not really engage with nationalist iconography. Instead, the major projects planned for 2017: the 5 de Mayo mural, a set of murals commemorating Mexican authors on the “Duraznal” apartment complex, Malecolor (a project creating the largest legal graffiti space in the world), and the Panteón San Nicolas pre-hispanic culture and urban legend mural, use elements of popular culture and popular identity to create a set of resonant images for the city, color therapy used to beautify public spaces. Panteon San Nicolas was the signature program of the first and second iterations of legal graffiti sponsorship in the city. In both iterations (2010 and 2013) the tall and massive walls surrounding the city’s largest cemetery were covered with portraits of La Catrina, an iconic figure for death, a beautiful woman with a skull face. However, members of Muraleon explained that this image as been “used up” or used “too much,” it is an image that does not necessarily come from León. Rather, it is an image that foreigners are invested in and use to imagine Mexico. In this project, writers are using images from pre-Hispanic culture related to death, urban legends, and images from a famous film from the golden age of Mexican cinema, Macario(1960), to renovate the image of the Panteón, and the City. Panteon San Nicolas. In process. 9.26. 17. Another limit is in the extent to which IMJUV can patronize the aesthetic development of graffiti. “IMJUV is concerned with youth and preventing delinquency,” Zhot explained in an interview, “they are not an arts organization.” The limits of institutional structures are also important to keep in mind when imagining how to design public arts programs. This question of limits is important, because it relates to larger questions about the situation of youth and social inequality in Mexico and an increasingly neoliberal (and attenuated) state. Rosanna Reguillo argues that during the postwar period “youth” became intelligible as a social category much more broadly (1940s-50s) and that this visibility also coincided in a rise in the language of “human rights” in the wake of fascist regimes. So, she reflects, paradigms for punishment of youth also changed, and the state was situated as a “benefactor” and when they are punished it is not castigation but “correction” and “care.” As promotores, writers are situated as arms (or fingers) of a benificent and caring state, part of a larger apparatus of maximizing the productivity of these social actors and channeling their affects and practices into more productive terrains, and persuading writers to acercarse(to get close to) the government. One of the ways that the Muraleon team is working to overcome the limits of art world perceptions of graffiti as “folk” and not “art” is by hosting a charity auction in late November/early December. Brote explained in an interview that such an event, pitched towards the CEO’s and executives who follow his and his crew’s work, will help convince León’s elite that graffi should, indeed, be considered as part of the plastic arts. Another way Brote sought to elevate his cultural capital as an artist is by participating in the Meeting of Styles festival, a global festival that I have studied in-depth over the last seven years. At this international festival artists can display their work to a multi-national public, and the fact of their participation holds a particular level of cachet, a possible analogue to the global contemporary artist who has the studio in London and one in Mexico City. Another limit is with respect to gender. Though there are two women employed in the fourteen-person Muraleon team, they so far have not been situated as project leaders, even though one of them has been active in the graffiti scene for a very long time. In terms of the content of many of the murals the female body or the female face is a recurring trope. Yet, these figures are frequently passive objects for the male gaze. Finally, in September an events called Malecolór was supposed to take place. This is an event designed to celebrate and inaugurate the opening of the largest permission graffiti space in the world: the full length of León’s Malecón del Rio, a concrete riverbed that cuts across the entire city, will be open to graffiti, day and night. Because of weather (rains) the even could not take place. Two participants in the HCUAP 2016-2017 pilot year, Stef Skills and Kane One, from Chicago, still came out to visit and the Muraleon team found a prominent wall under a bridge on Campestre that crosses the Malecón to paint. There, we spent the weekend under the bridge while the artists painted. It is a highly visible site, and Lalo Camarena estimated that about 10,000 cars pass a day. While there, we received a mix of catcalls, celebratory honks, and cars pulling over to take photos or to exchange contact information to request/commission mural projects. These everyday moments of contact are strong examples of the extent to which graffiti in León is increasingly accepted and even celebrated by the average resident. Stef and Kane’s reactions to the city, and appreciation for its textured surfaces also indicates the promise that León holds as a graffiti epicenter. Stef executed a somewhat site specific piece, her name in the style of hand engraved leather with jocular flowers surrounding it, Kane an abstract and atmospheric multicolored piece. Mersi, Zhot, Brote, JHard and Wes painted the middle section of the wall with a mix of lettered pieces, elaborate and abstract designs, a futuristic hip hop robot, and a face, complimenting the eyes staring at us from the opposite underpass. The opposite side of the highway, another bridge, had been painted by the team a few months ago and was a medley of different styles including a rudimentary hand created by the breakdance instructor, Neo. Finally, in September I met with Dr. Guillermo Adrián Tapia García, a professor in the social sciences department at Ibero, and the research team for the Instituto Municipal de Juventud. Dr. Tapia Garcia spoke eloquently about the emergence of “youth” as a social category, and a subject for academic analysis, an emergence that is fairly coterminous with the urban “boom” in the Del Bajio region. “Youth” are not a transhistoric or a trans regional category: economic, social, geographic, and political contexts inform when and how youth emerge. Moreover, there is a vexed relationship between youth and concepts of “citizenship” and public space because many early youth collectives were in fact Catholic groups working against a secular understanding of the state. 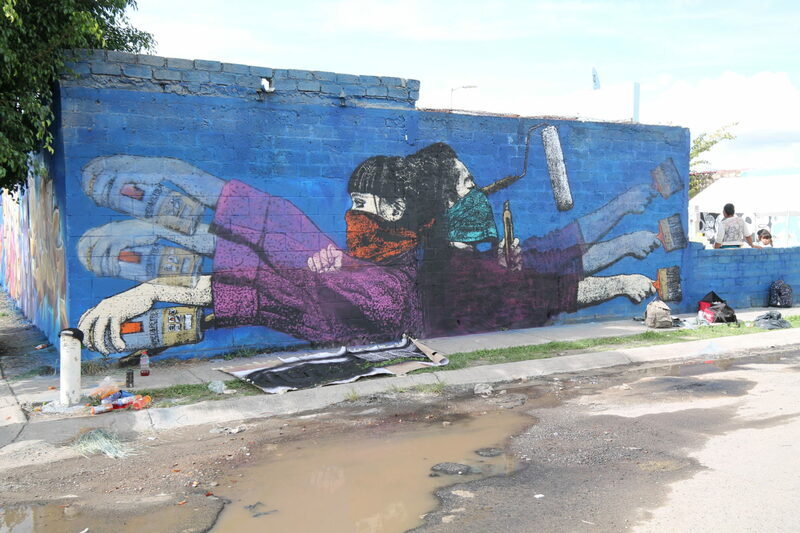 The places where graffiti became a social problem in León, he explained, are precisely the spaces of contention in the wake of modernization policies or deeply routed European/Indigenous urban divides. López Mateos was constructed about 40 years ago, and was created through violently destroying and rupturing numerous neighborhoods. The Malecón is a ‘natural’ border between what were Spanish and Indigenous settlements in León. Madero has long been the iconic walkway for the city, connecting the arch to the central plaza. That graffiti should begin in appear on these spaces en masse is offers significant evidence of a certain expression of voice by the displaced, the angry, or the talkative. Meeting with Roberto Ortiz, a photographer working on a history of rap in León, he discussed the centrality of the barrio as a social and imaginary site for the creation of rap culture and the mercado tecnico as something that only some rapper aspire to enter into, largely a decision dictated by class (those of working class backgrounds are more committed to rap staying outside of profit regimes, he commented), a kind of tendency that may also resonate with graffiti worlds. He, too, talked about the way that the contemporary image of León, and the historic center’s pedestrian walkways in particular, are relatively recent constructions, the product of initiatives designed to play up a new and particular image of the city (possible creative cities discourse localized in the Del Bajio context). To track in coming months is the kind of urban image Muraleon brings into focus. Zhot eyes. Campestre and Malecón. Photo September 2017. Starting the Campestre mural, 9.24.17. Opposing mural, Campestre and Malecón. 9.24.17. Kane One. In process. 9.24.17. Muraleon team and Stef Skills. 92.4.17. Kane One mural, Muraleon team. 9.23.17. Stef Skills, Neo, Jonathan. 9.25.17. Interview with Ante, September 2017. Kif discussion, September 16, 2017. Thank you to the IMJUV research team, Roberto, Guillermo, Sirik, Quena, Uriel, Brote, Ante, Kif, Ruben and others for rich discussions this month. This project is made possible through the Beca García-Robles/Comexus and Fulbright Western Hemisphere.